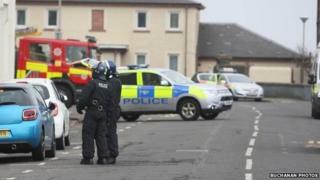 A 28-year-old man has been arrested after a 12-hour siege at a hostel in North Ayrshire. Police were called to the Short Stay Hostel in Princes Street, Ardrossan, following reports of a disturbance at about 23:50 on Monday. They discovered a man had barricaded himself in his room and was threatening to self-harm. Police negotiators attended the scene and the man was arrested at about 11:20. He was transferred to Crosshouse Hospital for medical assessment.